Due to my research on my house I was under the impression that it, and all the other ones in the row, was built around 1874-75 ish. The Historical Society sent out an announcement about their facilities on Mt. Vernon Square and getting ready for the Apple store (yay, I need a new mini). The library is closing up Friday, June 7th, but there are the online resources. So I went to the Ready Reference PDF. And that took me to DC.gov’s HistoryQuest DC. So I looked at the map, tapped on my block and discovered the houses on my row were built in 1872, not 1874/1875 as I thought. I’m in the right decade at least. So why did I think what I thought? Well I was going by tax records. Prior to the 1874/1875 tax year there was nothing there, according to the tax assessor. Unfortunately, the oh so helpful Sanborn and other fire maps don’t even bother with the Truxton Circle area until the 1880s at the earliest. HistoryQuest DC used the Washington Evening Star newspaper report on building permits as its source. That source said the owner, Jacob Been had permits dated July 5, 1872. Well, I guess Mr. Been could have waited 2 years to build. Around 4:50 PM. 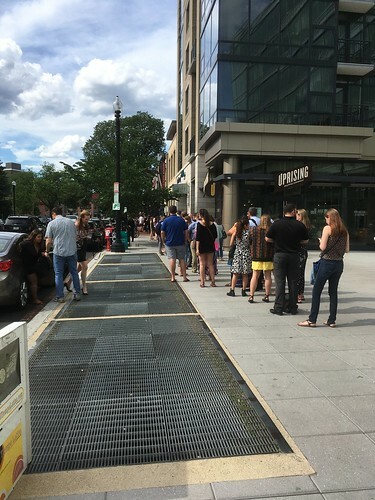 People in line for the Game of Thrones pop-up bar. Around 7:20 AM same spot. No line for Game of Thrones pop up. Yes, I’m old. I only stand in line for Rose’s Luxury. So I was going through some court cases, don’t ask why and happened to have noticed this thing. 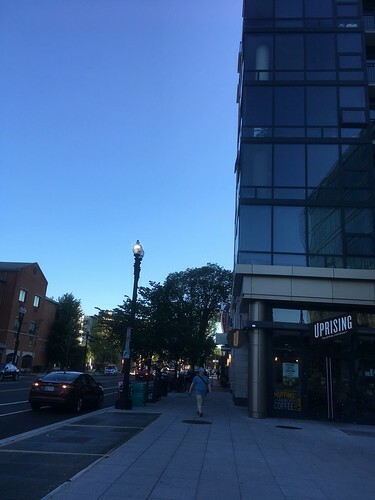 It is a lawsuit for a traffic accident that occurred at New Jersey Ave and R St NW on the border of Truxton Circle. 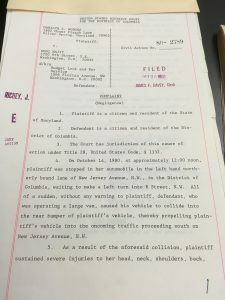 According to the first page at around noon on October 14, 1980 A Ms. Hodges was trying to turn onto R Street from New Jersey Avenue NW when she claims that a van for Budget Lock and Key hit her and sent her into the northbound lane of traffic. This is not news, and it is questionable if it is history. But if there is a friggin plaque on the 1500 block of 4th Street documenting a one time rec center, heck I can write about a traffic accident. The notable thing about this case is that there are depositions, oral histories of sorts, and one is from someone from the mosque on 4th Street. I glanced over that deposition and I’m not sure what he had to add to the case. The problem with some voices from the past is that they don’t always have anything all that interesting to say. 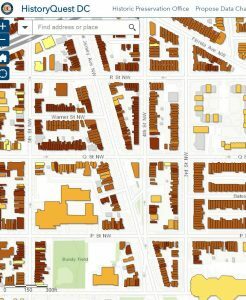 So last week I saw the good news from Scott Roberts that the ANC 5E voted to oppose the raze permit application for 319 R St NW. Since I’m not a house historian I’ll quickly mention 319 R and most of the houses on that block are Wardmans built around 1902-1903, by developer Harry Wardman and his architect Nicholas R. Grimm. My interest is that it at one point housed members the Glorius family, who had owned the whole block and lived there in the late 19th Century. So the house is special in that way. It is also special because it is a corner house. From what I can remember from the October 2016 BACA meeting the developers wanted to get rid of the turret on this building, among other things. The other things, like placing the entrance on the 4th St side, thus changing windows and doors, and putting on an extra floor, I actually have no problem with that. It’s getting rid of the turret that I have a problem with. Development has been done before, on this very block, a floor added and a turret kept. 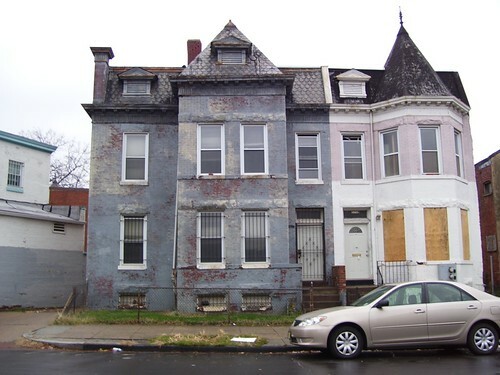 Back in 2009, I and resident of the 1700 blk of 4th St, John, fought to preserve a look for that block as the owner wanted to add a 3rd floor and obliterate the roof (with the turret) and replace it with something pitched and very suburban looking. I’ll admit the turret wasn’t the focus, preventing an ugly az popup was, as this was the time of horrible pop ups, popping up in the neighborhood. 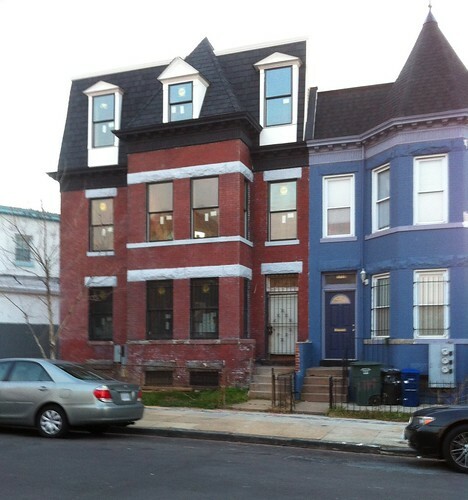 This is what 1721 4th Street NW (the blue/gray building) looked like in 2009. The shorter building to the left is the dry cleaners, and to the right that gap between the buildings is now gone and something plain and brick resides there now. I never had images of what the owner had suggested to the BZA. But imagine an extra floor and a “decorative” upside down ‘V’ of a roof, like you’d see in suburban Maryland on top. It was ugly. The owner had to go to BZA because this property was well over 62% of its lot occupancy. Unfortunately Jim Berry was no longer our ANC because he had moved/retired, and our ANC at the time (now city councilperson) was too trusting of the system so this fight was hard. Berry was there with neighbors at BZA hearing with the development on Richardson Place NW. 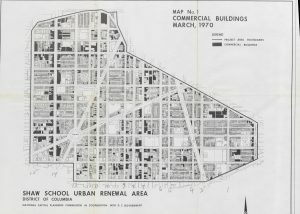 The ANC then, not so much, and there were fewer neighbors up in arms to fight the owner’s ugly proposal. Long story short, we prevailed and it was win-win. The owner got more square footage and an extra floor. We got something that looked good and was not an ugly as F* popup. Yes, the turret is absorbed into the house, but it isn’t too out of place. I believe that there can be a win-win with this developer. They can get an extra floor and new entrances (I dunno about parking, that’s another ball of wax) without destroying the turret. That block will probably see more development in the future and we’ve set a path for how that can look, I just hope the new people follow. Postscript- Yes, I know of this thing called historic districts. I oppose that for my own neighborhood. With historic districts we wouldn’t get such interesting houses like the Darth Vader house that just sold for a million dollars, or the interesting Ditto condos. Yes, we wouldn’t get the monstrosities on P Street, but there is enough good to outweigh the bad, you just have to be vigilant. So Truxton? Shaw? Bloomingdale? Where the hell am I? So this comes up way too often. So that’s why I decided with this re-boot (messy as it is) that I would call the In Shaw blog Truxton is in Shaw, because it is. Here is the quick and dirty and maybe in later posts I’ll go deeper. Bloomingdale is on the other side of Florida Ave, which used to be Boundary Street in the 18th century. Why Boundary Street? Because it was the boundary between the city of Washington and the county of Washington, in the District of Columbia. Bloomingdale, lovely as it is, was/is a suburban neighborhood, in the then county. Shaw. I have yet, to find ANYTHING, anything calling the area we know as Shaw as “Shaw” prior to the late 1950s, and even then it was called the Shaw School Urban Renewal Area. See the map there? That is of the Shaw School Urban Renewal Area. Everything in it, is Shaw. 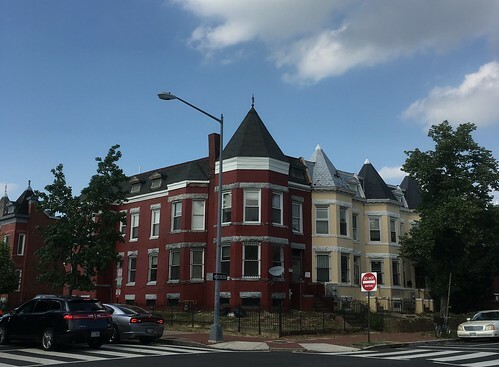 The area known as U Street, you will see it, in Shaw. The portion known as Logan Circle, you can find it in the map, in Shaw. Truxton Circle, look at the map, it is IN SHAW. If it is in this map, it is in Shaw, which kinda stopped being a thing sometime after Home Rule and wards were a thing. I’m going to let this go live. And maybe next month I will try to bring back or fix the URLs for the previous 2010-2017 blog entries on the Inshaw Blog. But it isn’t going to happen anytime soon. As the blog title hints there are several things going on in my off-line life. For one I have a money pit in Baltimore. Second, I have an in-law situation where we are attempting to move my mother-in-law from CA to DC. Due to a horrid mix of complications and bad lawyers it is a slow moving tragedy I have to keep my eye on. Third, our AC died and apparently needs to be replaced. This is tiny in relation to the other two things, and we went out and bought some units from Home Depot so at least part of the house can be cool. Maybe, just maybe after I’ve fixed and undone poor workmanship, got my mother in law settled in a place where we can better care for her and the Summer heat is behind me, I can clean up all the messy files on my server. This is just a placecard until I figure out how to deal with the change from MT to WP for the blog. As you can tell I’ve moved from Inshaw with more gentrification to Truxton is In Shaw, to mainly say… Shaw is a huge neighborhood and Truxton is/was part of it.